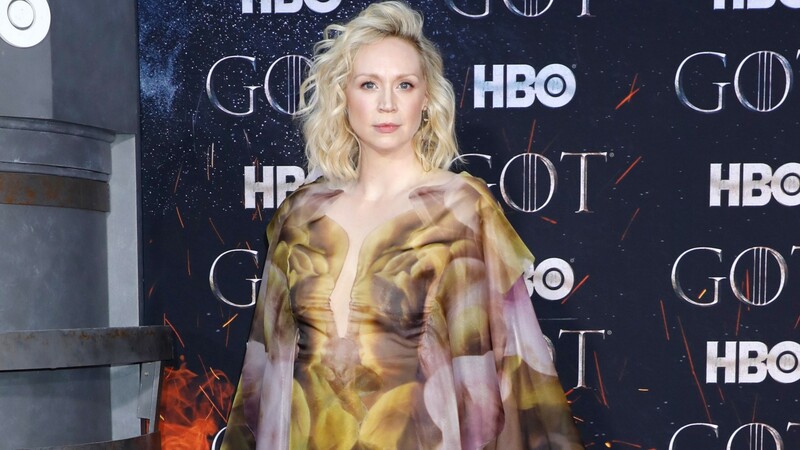 We all need to bow down to Gwendoline Christie, who plays Brienne of Tarth on Game of Thrones because she is literally all we can think about this morning. Why? Because Christie made a big impression at the GoT finale season premiere, which took place on Wednesday, and it needs to be recognized. Like, ASAP. Not only was her dress exquisite, but she was serving up excellent commentary about her role in the show and the season ahead, and we’re living for all of it. First off, we need to talk about how stunning Christie looked. The minute the internet got a good gander at her Iris Van Harpen dress, which was a pink and chartreuse dream of outfit that just flowed all around her, we all basically freaked out. Seriously, the reactions to Christie’s premiere dress instantly became a talking point on Twitter. And if the dress wasn’t enough, Christie’s comments to reporters also drew some buzz. Speaking with Variety, Christie said she thinks Jamie Lannister is irredeemable in the final season and reminded us of the power of the female characters, herself included, on GoT. But Christie wasn’t the only cast member at the final season premiere who stole the show. In fact, the final season premiere saw the return of long-gone actors like Jason Momoa, Charles Dance and Pedro Pascal, who played Khal Drogo, Tywin Lannister and Oberyn Martell respectively, as well as current cast members who we’ll soon be watching closely in season eight. The GoT Instagram account even posted fun video montages of different cast members, including Christie, Kit Harington, Peter Dinklage and Sophie Turner, all posing for the cameras inside a set designed to look like a cave. Y’all, we are living for these premiere videos! Finally, perhaps the most emotional moment from the premiere involved the entire cast of key players from all eight seasons taking the stage at the premiere. While standing in front of the crowd, they received a standing ovation for their work on the show. It was a very chilling but beautiful moment that will no doubt make fans of the show sentimental. The final season premiere was huge for GoT cast and fans alike. It’s hard to believe the end is near, but it’s coming quick. Make sure to tune in to the GoT season eight premiere on Sunday, April 14 on HBO.